To create value and relevance financially, intellectually and professionally by enhancing the innovation culture at Jefferson. In the summer of 2014, Jefferson reintegrated Thomas Jefferson University (TJU) and Thomas Jefferson University Hospitals (TJUH) and began the process of reinventing the academic health center. The basis for this transformation is our “Blueprint for Strategic Action,” which calls for Jefferson to operate around four pillars – Academic, Clinical, Innovation and Institutional Advancement. As the Innovation Pillar, it is our job to foster ideas and convert them into products and services. The Innovation Pillar is where we test new business models and nurture entrepreneurialism among employees, students and the Jefferson community. We want to make a profound change by adopting new forms of value creation. Universities have always been good at ideas; Jefferson Innovation is going to bring those ideas to you. 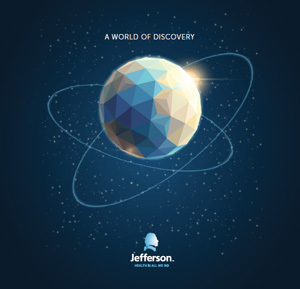 It is our goal to create a Jefferson-wide entrepreneurial ecosystem to advance the commercialization of new technologies by supporting members of the Jefferson community through superior services, mentorship, education and partnerships in translating new discoveries into practical applications. Creative Brief: As EVP, Dr. Ritts is creating a world-class engine for innovation at Jefferson, advancing our commitment to developing products and services for commercialization, and in partnership with like-minded organizations, driving unique programs that transform how we deliver patient care and education and bring to market novel treatment therapies. In addition to driving innovation efforts for Jefferson Dr. Ritts manages the commercialization staff for the Office of Technology Transfer and Jefferson Accelerator Zone members who support the creation of transformative educational and programmatic initiatives within that group. Background: With more than 20 years of experience in creating partnerships driven by emerging technology and new business model creation, Dr. Ritts is a leader in her field. In addition to her previous role at Duke University, Dr. Ritts managed emerging venture-capital funded newcos and served as the Director of Biotechnology and Materials at Sarnoff Corporation and Program Manager at the US DoD DARPA. While at DARPA she served on a number of government think tanks and review panels across DoD, NIH, NSF and DOE. Dr. Ritts received her undergraduate degree from Duke University and earned both her PhD and MS degrees from Stanford University. Creative Brief: Designer of leadership strategies. Past roles include Managing Director of the Life Sciences portfolio of the Eastern Technology Council; President of the Franklin Health Trust; special limited partner in PA Early Stage Partners Fund III; advisor to a number of life science startups and venture capital groups; member of the CURE Board, distributing $11 billion in tobacco settlement funds over 25 years; the Boards of Trustees of Drexel University, Drexel College of Medicine, and Drexel Law; and PNC's Women's Financial Services Network Advisory Board. Served in the Rendell administration as Deputy Health Commissioner of Policy and Planning, and advises Senator Robert P Casey on health issues. Public roles: Author of book Provider of Last Resort, columnist and TV commentator in numerous national and regional venues. Before joining Jefferson, consulted for non-profits and corporations on strategic planning and project implementation in life sciences and health care. Background: PhD, University of Pennsylvania. Joined Jefferson 2013. Creative Brief: Dr. Rose works with Jefferson faculty, staff and students to identify patentable subject matter within their work and coordinate invention disclosures and patent filings. Dr. Rose oversees patent prosecution on University owned intellectual property by outside counsel, assists with strategic de-risking, identifies suitable commercial partners and coordinates targeted marketing efforts. When suitable partners are identified Dr. Rose negotiates the agreements necessary to effect commercialization efforts. Background: Heather Rose PhD, JD joined the Innovation Pillar as the Director of Technology Licensing in February 2017. Prior to joining the Innovation Pillar at Jefferson, Dr. Rose worked for five years in the Drexel University Office of Technology Commercialization as a Licensing Manager focused on commercializing inventions in the life science disciplines. In addition to a JD with a concentration in intellectual property law obtained at the Kline School of Law, Dr. Rose also holds a PhD in Cellular and Molecular Biology from the University of Pennsylvania School of Medicine. At Penn, Heather performed and presented research about how retroviruses choose genomic locations for insertion of the viral DNA into the host chromosome with an overarching focus on safety and predictability in delivering therapeutic gene doses for gene therapy applications. While in law school Heather interned for two consecutive terms at the Corporate Intellectual Property Department of GlaxoSmithKline. Heather is a member of the PA, NJ, and United States Patent Bars. Creative Brief: Mike manages the financial and administrative functions of the Innovation Pillar. Background: After five years with Jefferson Treasury Shared Services, Mike joined the Innovation Pillar in May 2017. Mike earned his MBA from Temple University. Background: Amy joined the Innovation Pillar in April 2018. She previously spent nearly eight years as a Senior Research Analyst for the health and life science practice of Oliver Wyman, a management consulting firm. Prior to that Amy practiced intellectual property law at Dorsey & Whitney LLP and Kenyon & Kenyon LLP with a focus on trademark, brand management, and advertising and promotions law. Amy holds a JD from the University of Pennsylvania Law School and Master of Bioethics from the University of Pennsylvania School of Medicine as well as a Master of Library Science from St. John’s University and a BS in Biology from St. Joseph’s University. She is a member of the NY and United States Patent Bars. Background: Adam Greenspan joined the Innovation Pillar in April 2018 with over fourteen years’ experience in technology development, translation, and commercialization. He was previously Director of Business Incubation at the University City Science Center in Philadelphia, where he oversaw facility and program operations and delivered advisory support to over 70 research and technology-based startup companies. Prior to that, Adam ran the Science Center’s QED proof-of-concept funding program before subsequently launching Aries Medical Textiles, a startup company developing antimicrobial textile garments. Additional experience includes working in the Johns Hopkins University technology transfer office to support licensing activities and conducting quality control testing of biomaterial formulations for orthopedic trauma medical device company DePuy Synthes. Adam has degrees and research experience from Johns Hopkins (BS Biomedical Engineering/Materials Science), the University of Florida (Graduate research assistant), and Drexel University (MS Biomedical Engineering). He is also registered as a patent agent with the USPTO. Creative Brief: Michael works alongside the Innovation Pillar staff, assisting in projects relevant to innovation and entrepreneurship at Jefferson. His specific responsibilities include surveying venture investments in target market spaces to identify areas of opportunity to create synergies among divisions, and supporting Innovation with patent and market research linked to disclosed inventions and identifying potential business development opportunities. Background: Michael joined the Innovation Pillar at Jefferson in June of 2018. He studied political science at University of Delaware before completing his MS in public policy from Drexel University. Michael later completed his JD in Health Law from the Drexel University Thomas R. Kline School of Law. Michael is now interested in the field of medicine and has since completed the pre-health studies post-baccalaureate program at Thomas Jefferson University. During his year as a Jefferson Innovation fellow, he plans on preparing for medical school. Creative Brief: Cathy works alongside the Innovation Pillar staff, assisting in projects relevant to innovation and entrepreneurship at Jefferson. Her specific responsibilities include identifying grant prospects in the public and private sectors as well as planning innovative programs such as the Innovation Engagement Speaker Series, JAZ Tank, and the annual Dance Party. She also serves as director for Jefferson Health Hack. Background: Cathy has experience working with national retailers such as QVC, Macy's and worked for the US offices of TAL Apparel specializing in textile product development before pursuing her MBA with Jefferson University. Creative Brief: Robert assists the Chief Innovation Officer at all levels of administrative support, planning and research. Robert also supports the Innovation Pillar via event planning, meeting logistics and office management. Background: Robert joined TJU in October of 2016 after moving to Philadelphia from New York, where he provided support to C-level Executives for 6 years in the publishing and advertising industries. A University of Delaware alumni, Robert has spent his career as an executive assistant focusing on process improvement and knowledge sharing platforms.